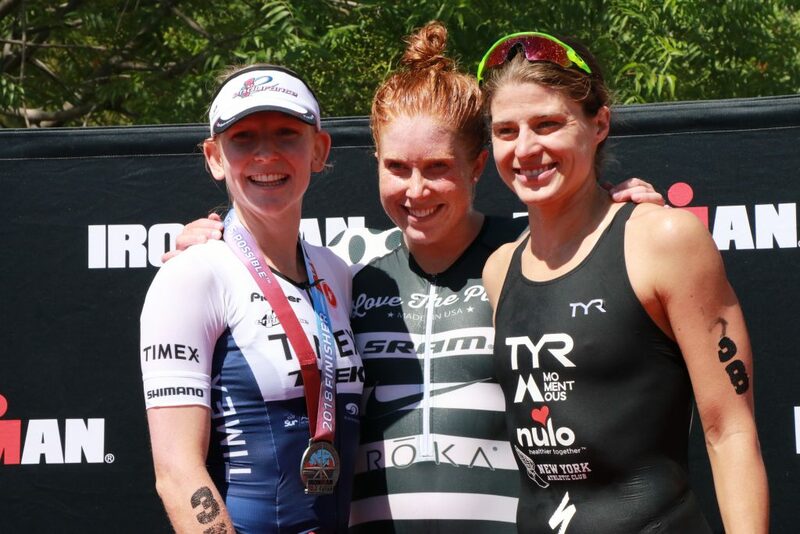 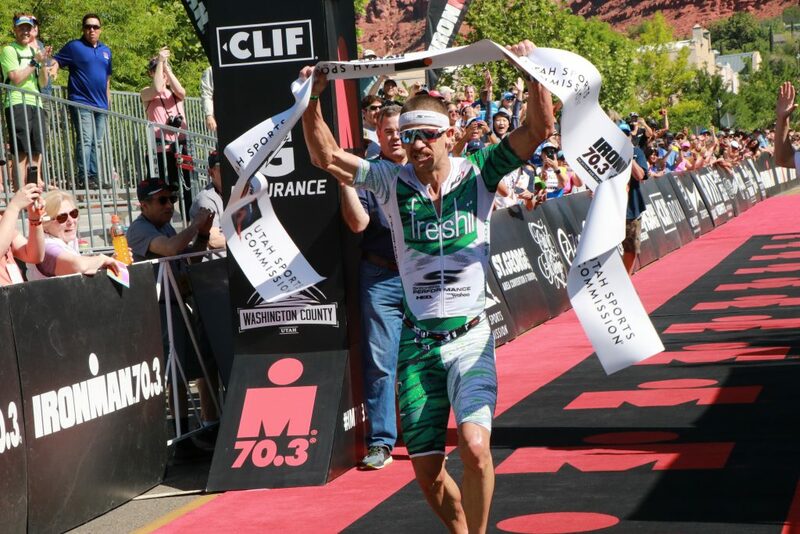 ST. GEORGE – Canadians Lionel Sanders and Paula Findlay won the men’s and women’s, respectively, Ironman 70.3 North American Pro Championships St. George Saturday. 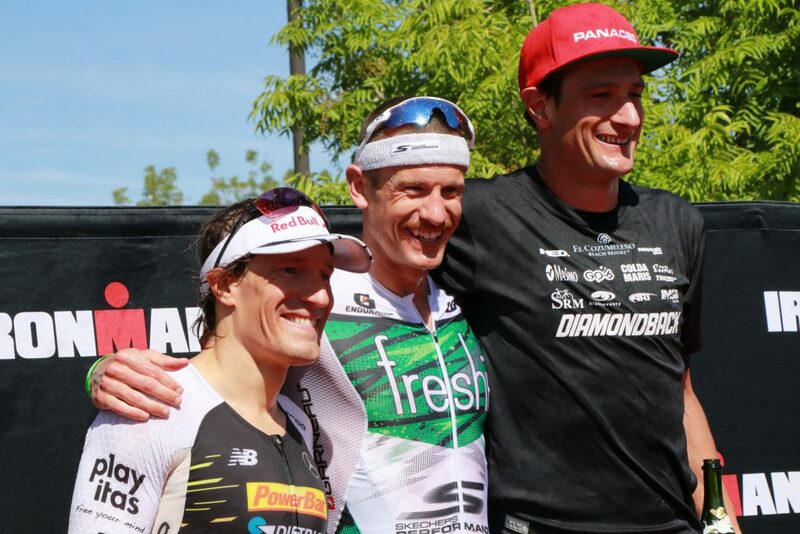 Sanders set a new course record with a time of 3:41:11, breaking the old record of 3:41:58 established last year by Alistair Brownlee of the U.K.
Coming in second place in the men’s race was Sebastian Kienle of Germany, who finished in 3:42:38, or 1 minute 27 seconds behind Sanders. 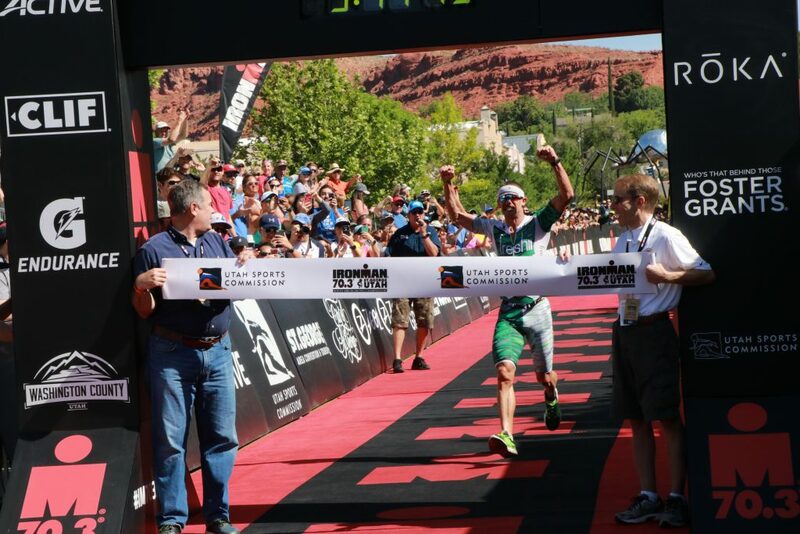 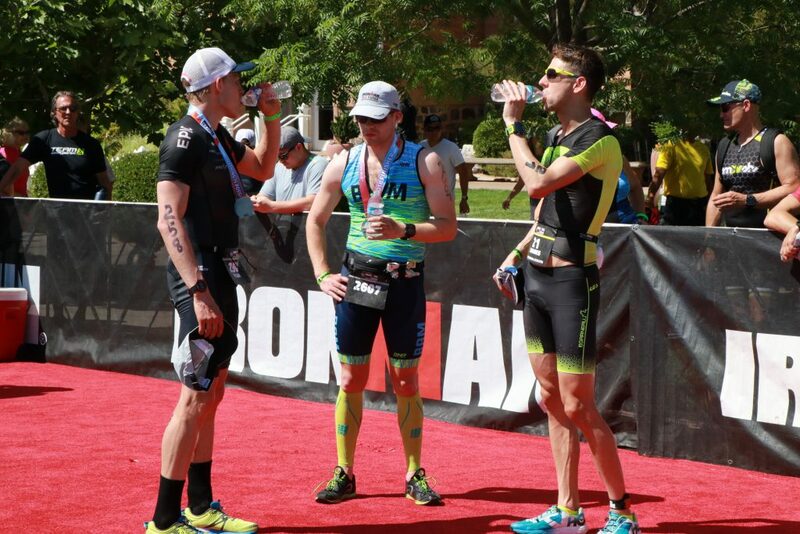 Sanders and Kienle had completed the first leg of the event – the 1.2 mile swim in Sand Hollow Reservoir – within two seconds of each other, with Sanders finishing the swim in 25:26 and Kienle in 25:28. 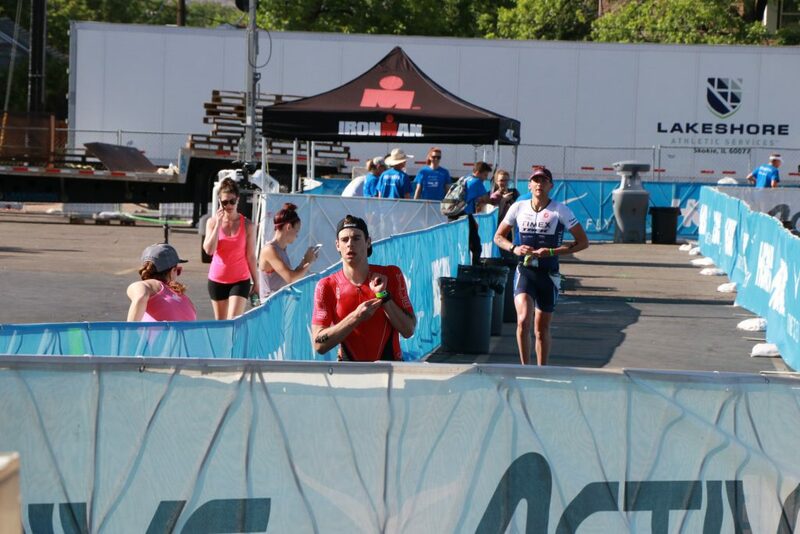 They were the eighth and ninth competitors out of the water. 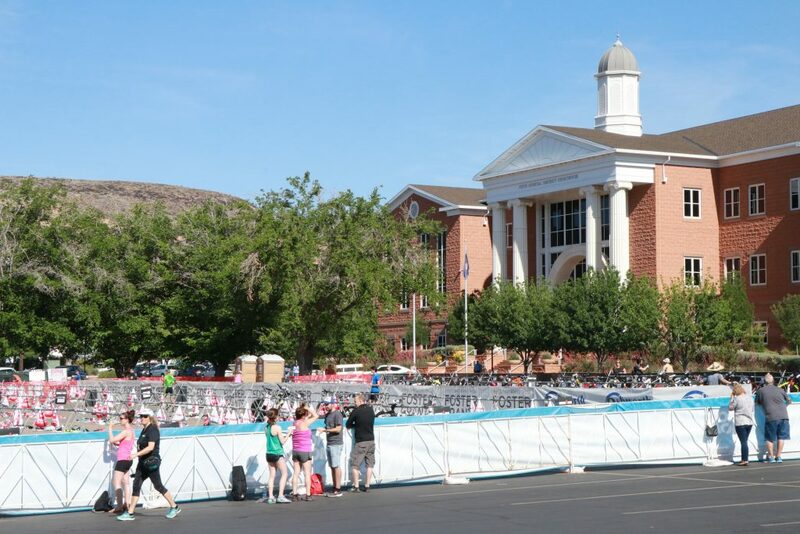 The water temperature at the event’s rolling start just after 7 a.m. was 62 degrees, with an air temperature of 59 degrees and very little or no wind. 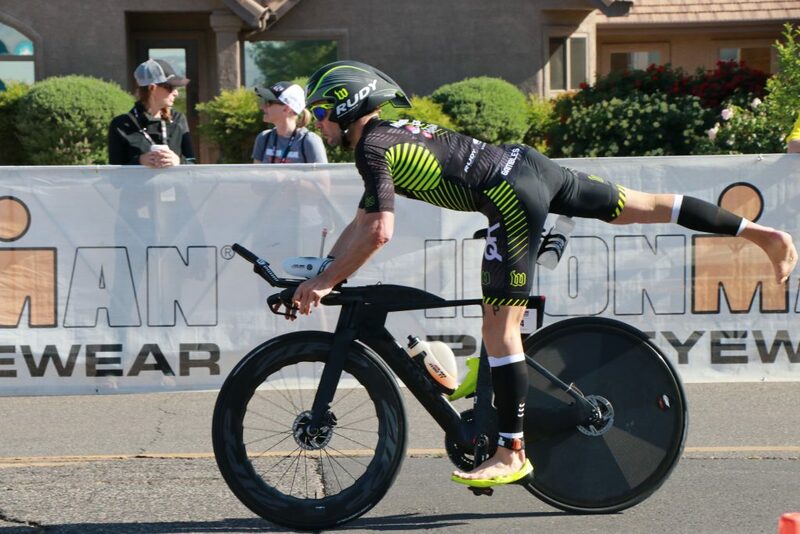 During the second portion of the event, the 56-mile bike ride, Kienle was the fastest competitor, moving into the overall lead by completing the bike leg in 2:01:15. 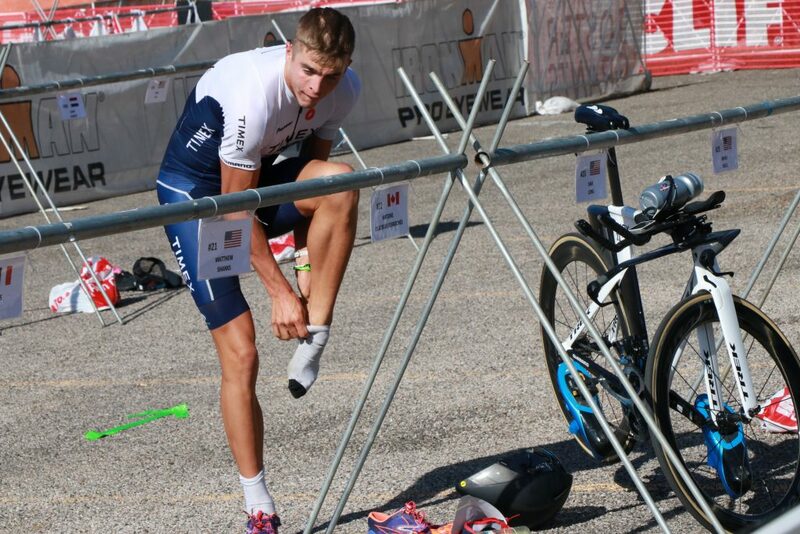 He opened up a 15-second lead on Sanders, who completed the bike portion in 2:01.32. 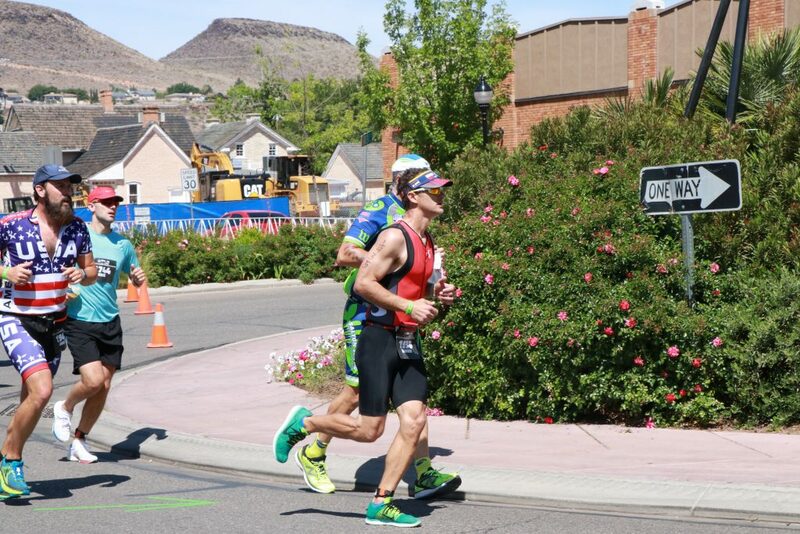 That left the third and final leg, a 13.1-mile run that follows a loop from Town Square Park and goes along Bluff and Diagonal streets before climbing up Red Hills Parkway through and along the south end of the Red Cliffs Desert Reserve and back to the heart of downtown St. George. It was during that final leg that Sanders was able to overtake Kienle for the overall victory. 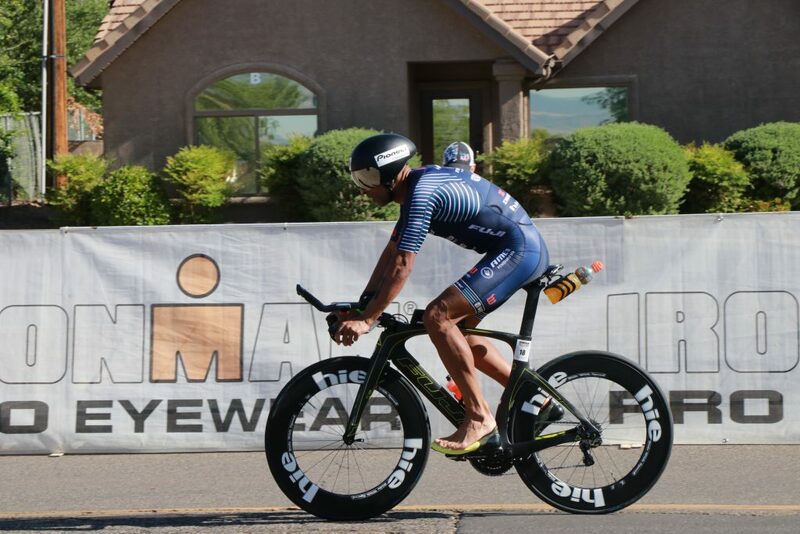 Sanders completed the running portion in 1:11:47, while Kienle finished that leg in 1:13:14. 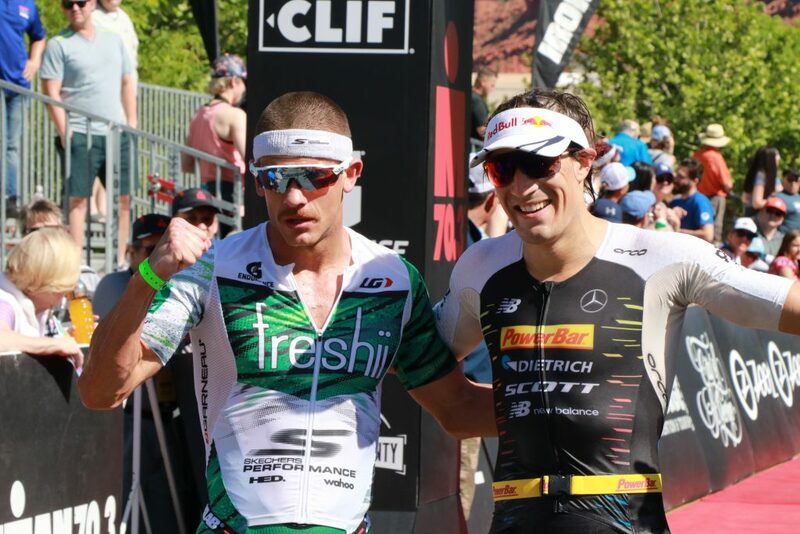 They were the second- and third-fastest finishers in the running portion, however, as Austrian Michael Weiss had the best run time with 1:10:41. 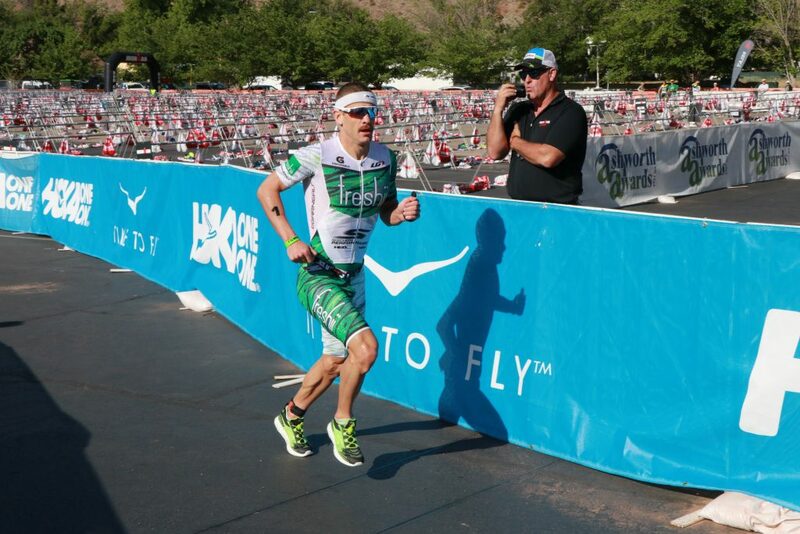 Weiss finished third overall with a time of 3:43:14. 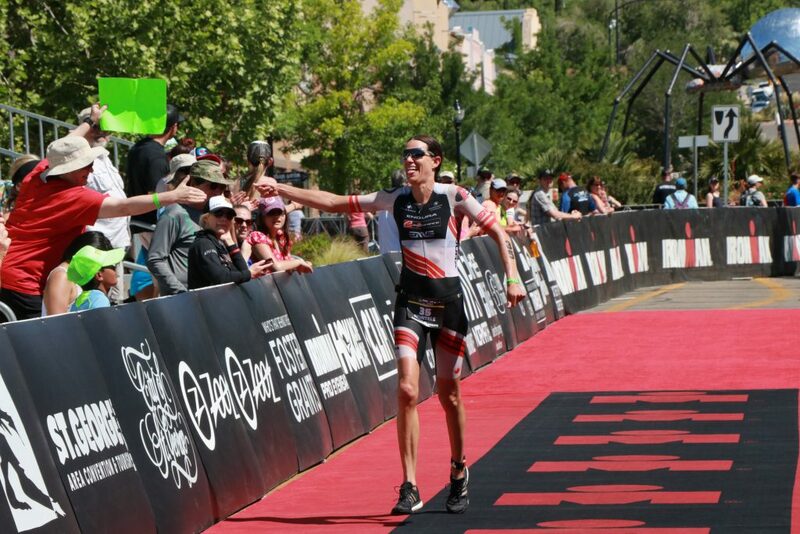 Hundreds of spectators clapped, cheered and took photos with their cell phones as the top finishers approached the finish line. 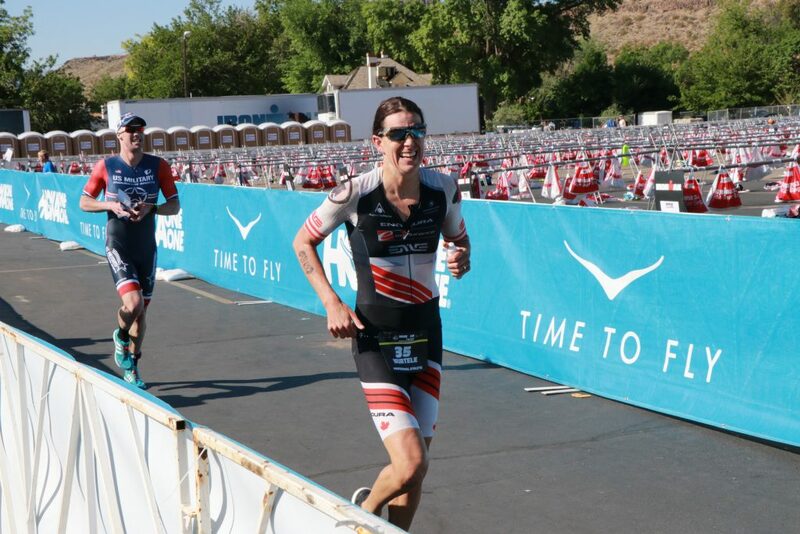 Afterward, Sanders told St. George News that while the course itself is challenging enough, he knew Kienle would be right with him to the end. 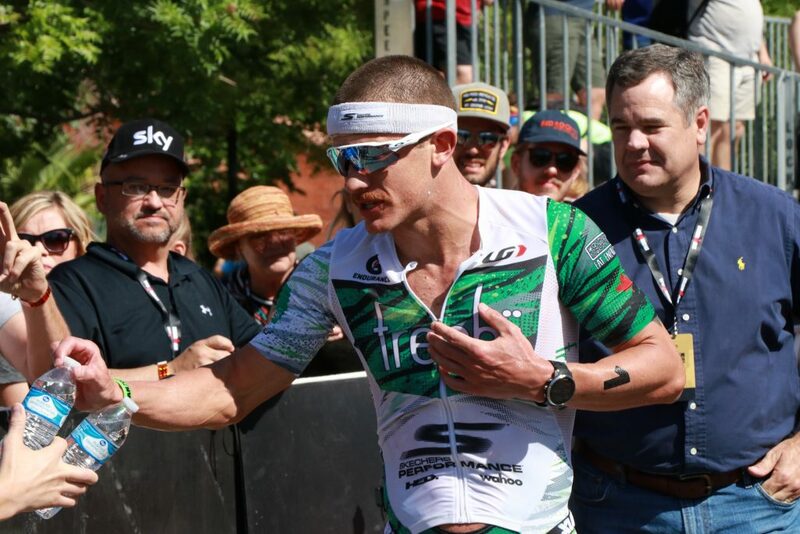 “It’s just all the more reason to get your nutrition and hydration in check because you’re gonna need to be able to close very well,” Sanders added. 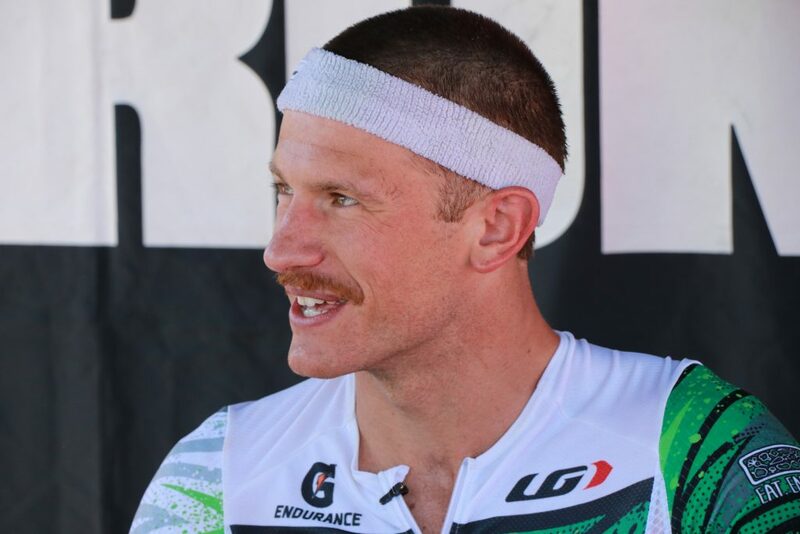 Sanders said that while he was happy to set a new course record, he doesn’t expect it to last long. Sanders said that more important than a record time, was the goal of getting himself into peak condition for the race. 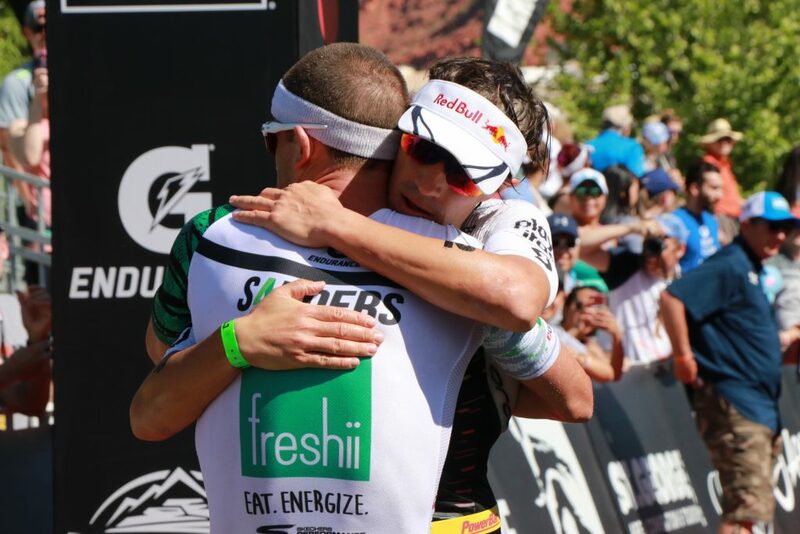 “One goal of mine was to get back to how I used to race,” he said. About a half hour after the top male finishers crossed the finish line, Findlay claimed the women’s title with a first-place time of 4:15:53. 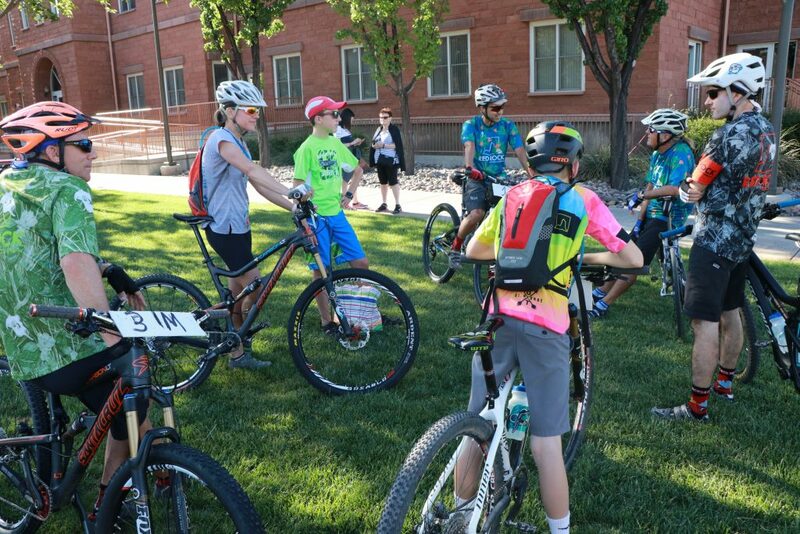 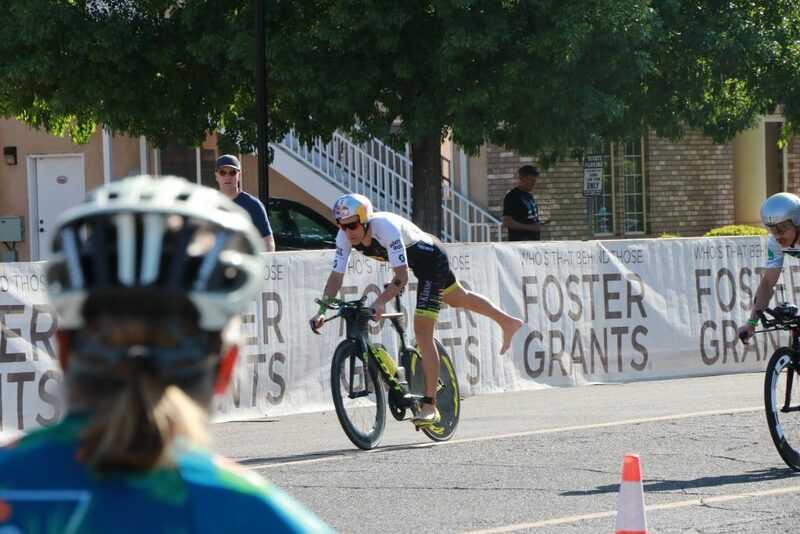 Notably, Findlay didn’t place first in any of the three individual legs, taking fourth in both the swim and the bike ride and third in the run. 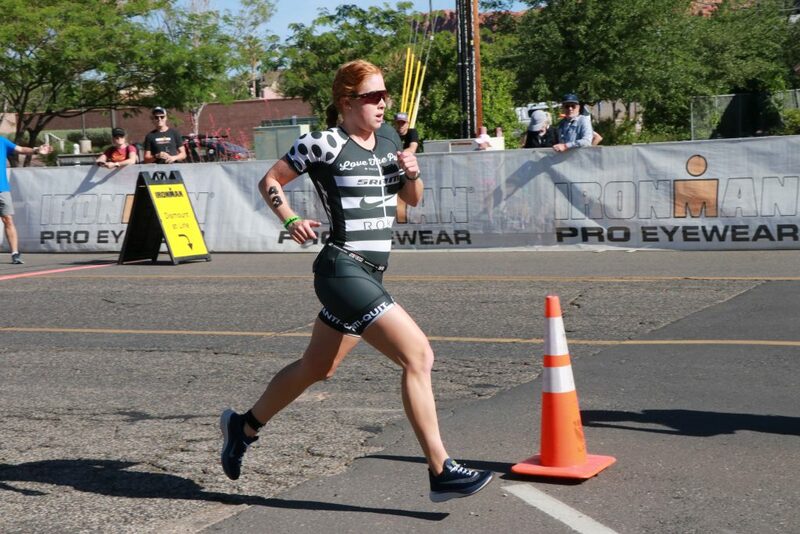 Her respective times were 24:46 for the swim, 2:25:11 for the bike and 1:23:05 for the run. 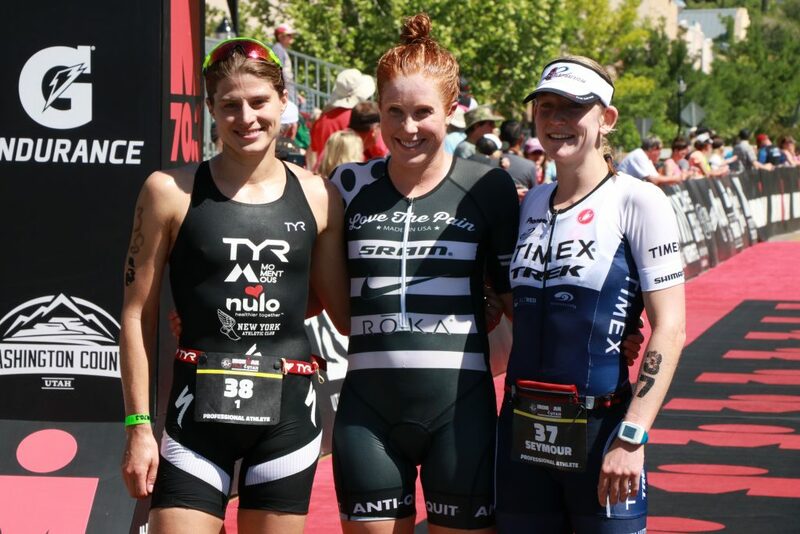 Coming in second place for the women about a minute and a half behind Findlay was South Africa’s Jeanni Seymour, who finished in 4:17:19. 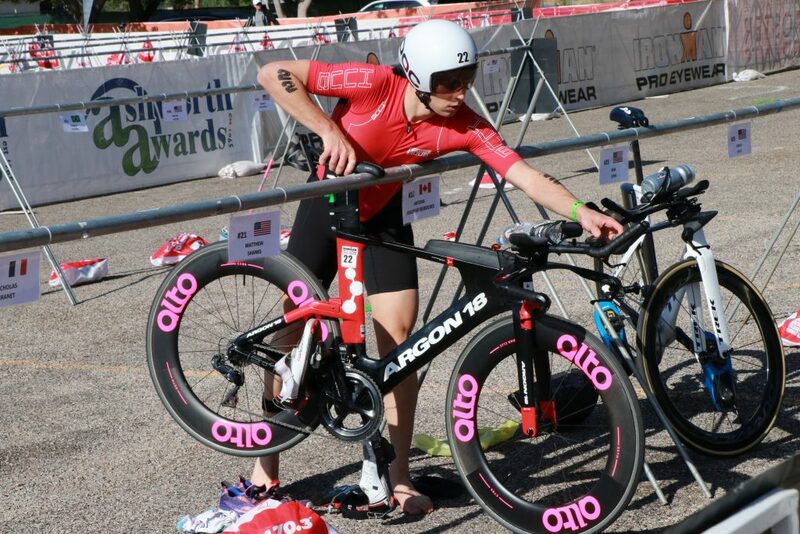 American Sarah True placed third in 4:17:46. 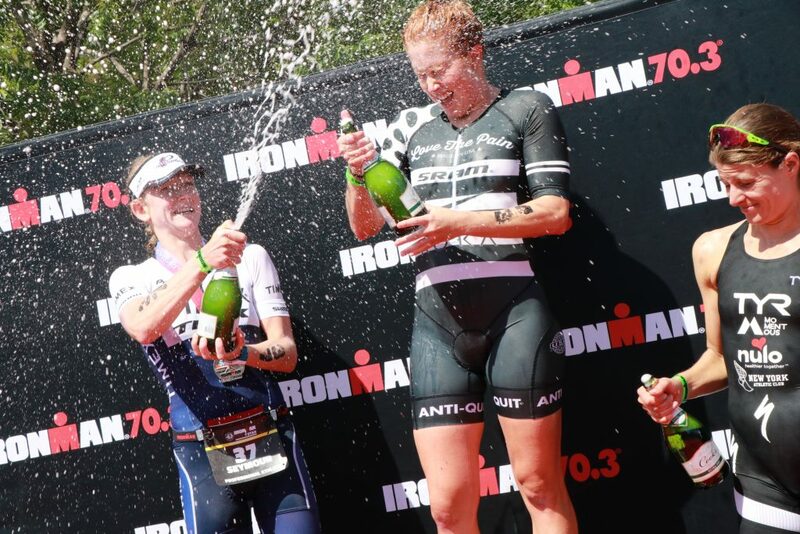 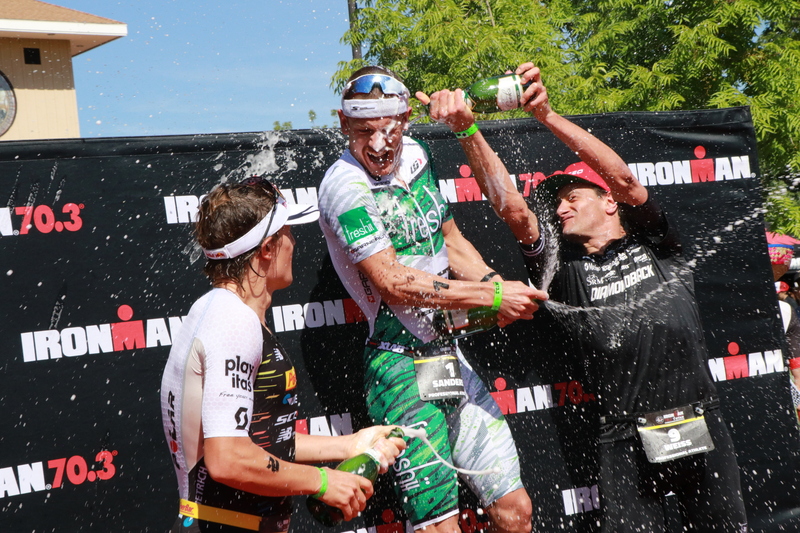 Just as the top three men had done a short time earlier, the top female finishers doused each other with champagne while posing and celebrating atop the post-race medals podium. 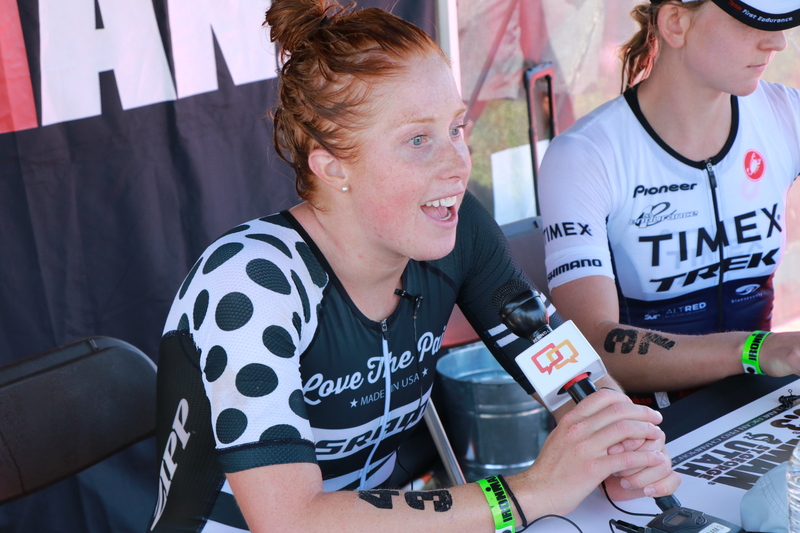 “I had a surprisingly good swim and felt really good on the bike,” Findlay said during the press conference following her victory. 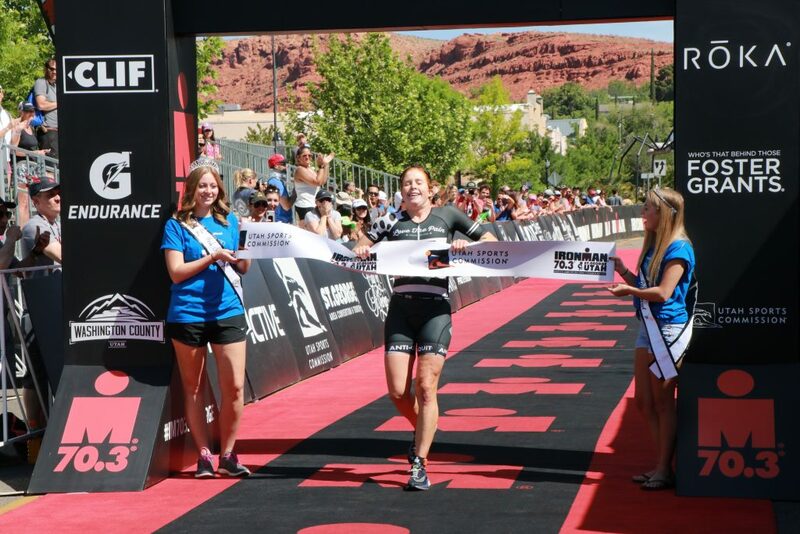 Fellow Canadian Heather Wurtele — a four-time winner of the St. George race — finished sixth among women with a time of 4:22.50. 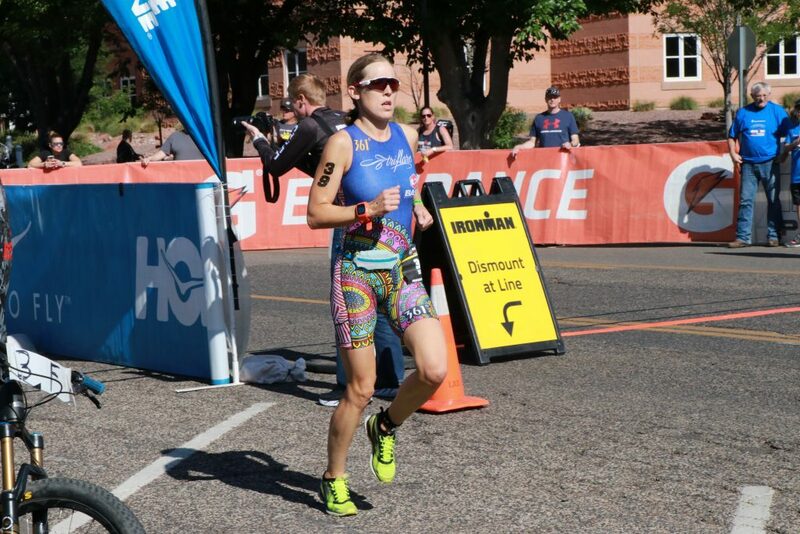 Wurtele said she didn’t feel well the morning of the race. 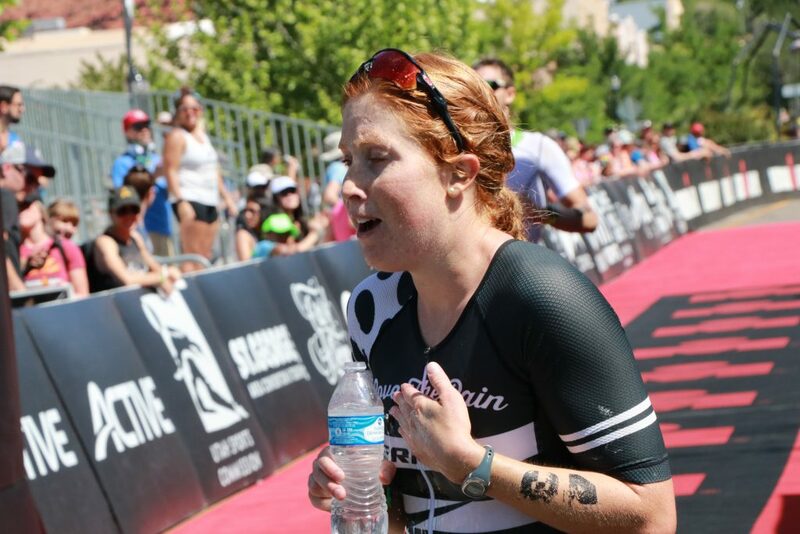 “I was just kind of empty, but that happens sometimes,” she said. Her husband Trevor Wurtele finished eighth among the men with a time of 3:57.19. 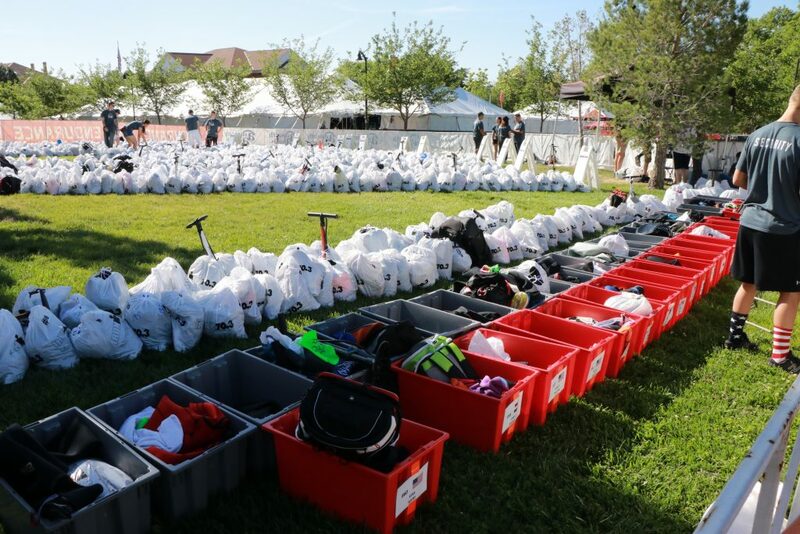 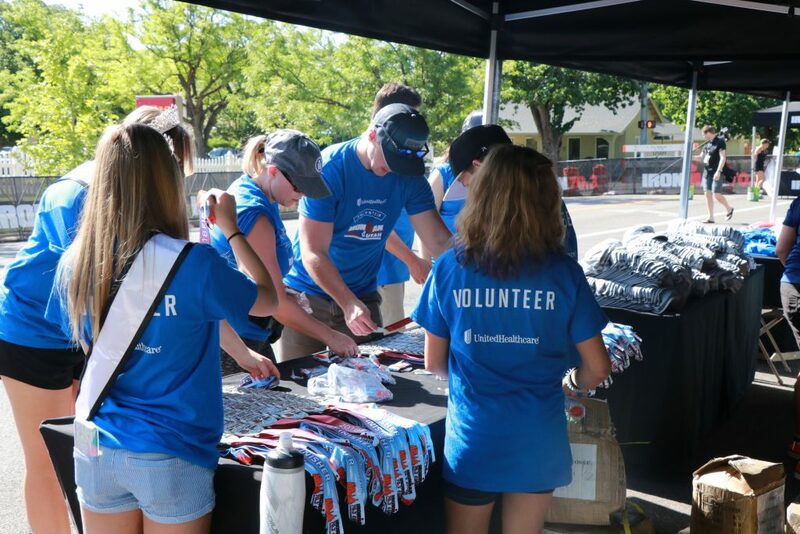 In addition to the 54 professional entrants, nearly 2,700 other people were registered to compete in Saturday’s race. 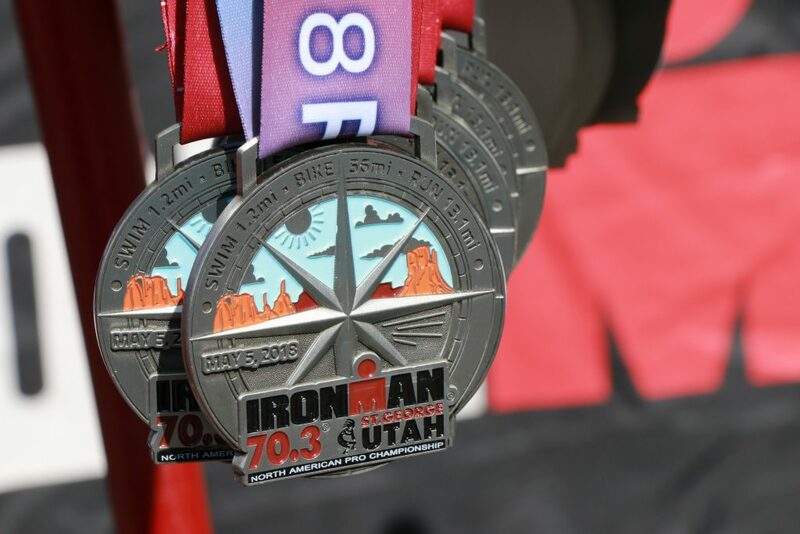 For complete results and other information, visit the Ironman website.